Review posted June 21, 2014. I began this book when I had recently decided to try online dating. When I finished it, I was already in a relationship. By the time I’m posting the review, I’ve broken up with that first person. But the overall idea of the book fits perfectly with the reason I’d decided to try online dating. I’d noticed that once I actually meet someone, it’s harder for me to see the ways they are not necessarily good for me. Once my emotions get involved, it’s harder for me to exercise good judgment. So my thinking with trying online dating was this: Why not screen out people who obviously wouldn’t be great for me right from the start, before I even meet them in person? 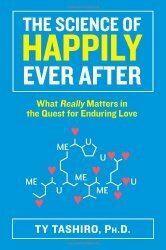 The Science of Happily Ever After fits perfectly with that idea, because it presents some objective things to look for when contemplating a long-term relationship. In fact, it’s given me some things to look for once I meet people that might be red flags. Why not optimize one’s chances of happily ever after? Although supportive friends, self-confidence and communication skills contribute to healthy romantic relationships, a much stronger predictor of romantic success is the type of partner you choose in the first place. The traits that a partner possesses before you ever start dating, such as his or her personality and values, are among the strongest indicators of whether a romantic relationship will be happy and stable many years later. However, for people who say they will choose a better partner for the next relationship, the intention to choose a better partner does not guarantee that they will end up making better choices. How many times have you witnessed friends who are smart and effective people in most aspects of their lives repeatedly choose the same dysfunctional partners and then appear surprised when the relationship is a disaster a few months later? This book does give tips as to how to help yourself pull off a good choice. This is not a prescriptive self-help book promising a soul mate in three easy steps. Love is too complex and too personal for a stranger to tell a unique individual like you precisely what to do with your love life. Instead, my goal is to help you clarify your version of “happily ever after” and then to provide you with the information needed to make wise decisions when choosing a partner…. The Science of Happily Ever After is about making smarter choices. It’s about learning to weed out the undesirable traits and rethinking our views about what really matters in a romantic partner. Along the way, Ty Tashiro discusses studies that have been done on what makes an enduring relationship. These give you some ideas on what you should look for. He points out that you’re not going to get everything you want, since no one is perfect, and gives you ideas for which “three wishes” you should prioritize. The fact remains that when it comes to choosing a romantic partner, what you see is what you get. Forever. Although this second type of change is possible, why would you go into a marriage relying only upon a partner’s willingness to manage their negative traits, rather than choose someone from the start who gives your relationship the best chance of success? Partners who give your relationship the best chance of success also tend to be the kind of people who are most likely to manage whatever weaknesses they have with maturity. So, once again, finding happily ever after begins with choosing someone with the right traits. I do love it that this book came in right when I’d started dating someone. And I’m proud that, for the first time in my life, I broke up with someone – and stayed friends with him. Whatever my future holds, I feel like this book is helping me evaluate relationships from a more rational place, thus increasing my odds of one day living happily ever after.